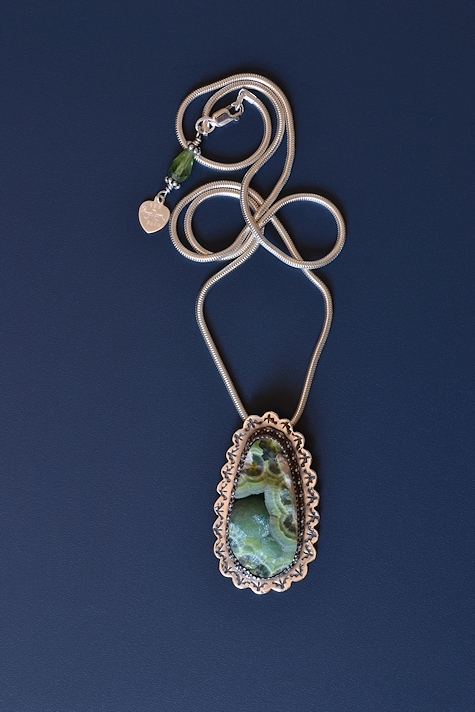 Some folks have told me they would prefer small pendants to my normal richly embellished neckpieces. So I have collected some interesting small stones and here's one. 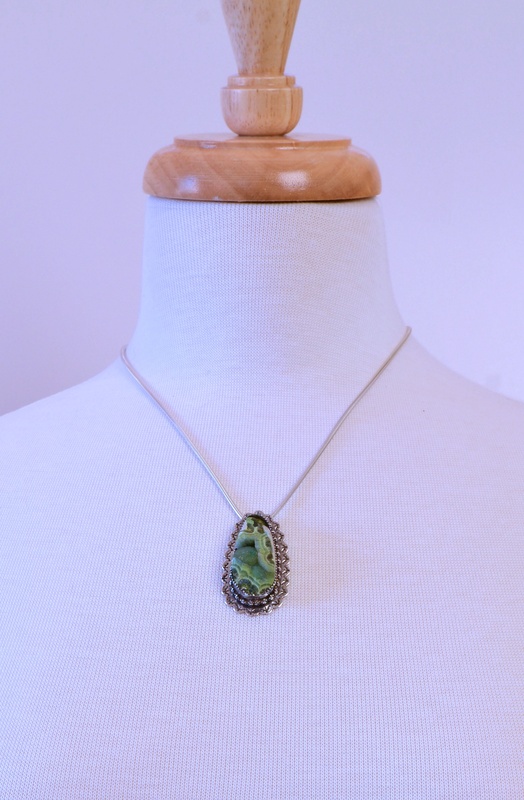 Be sure to click on the middle thumbnail to see the botroidal (grape-like) surface and the fascinating layers within each grape of the Smithsonite. What, you've never heard of Smithsonite? It was named after James Smithson whose bequest funded the Smithsonian Institution. It is ZnCO3 which appears greenish (or bluish) from the addition of a bit of copper. Other variations include white, yellow, pink, purple, gray and brown. Given the colors of this little beauty, it might well have come the Kelly Mine in Magdalena, NM which produces what little jewelry-grade Smithsonite we see. Dr. Pough (see below) gives fascinating bits like how to test for Smithsonite: "Only good test is in a closed tube, when the white material is coated with film that is yellow when hot and white when cold..." One little line in his thick book gives us a taste of how much work has gone into developing test protocols for minerals! It is interesting that Dr. Pough gives a page and a half to Smithsonite whereas he gives only two little paragraphs to agate. We jewelry lovers distinguish, celebrate and ruminate about innumerable forms of agate (just use my search function to see lots and lots of them), but a mineralogist clearly has entirely different priorities! Moving on from the physical to the metaphysical, Simmons (again, see below for reference material) says Smithsonite's element is water and says it is one of the best stones for soothing the emotional body and relieving stress. 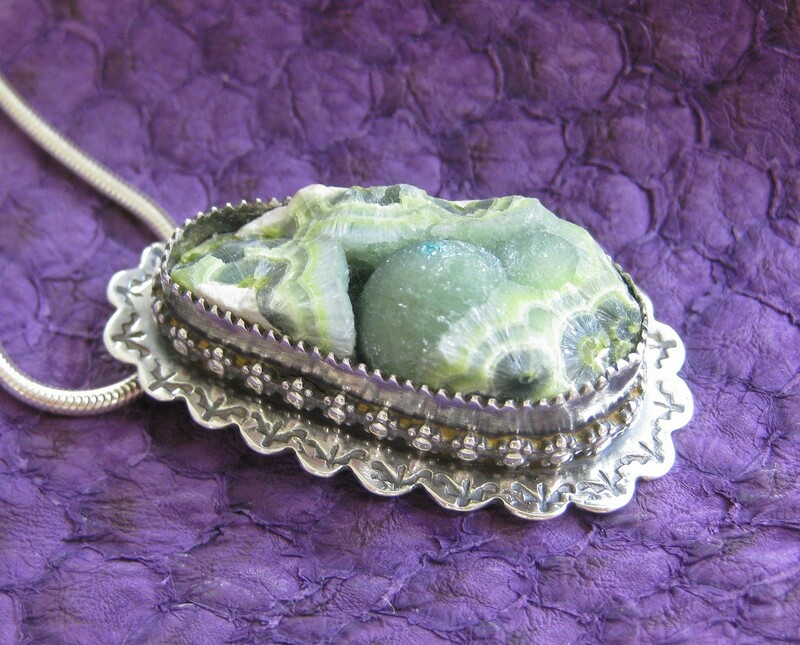 Ahsian says that at the spiritual level, Smithsonite has come to teach us about Love. Melody associates it with the astrological signs of Pisces and Virgo. After discussing all that, various experts have written to tell me that the pendant is actually Wavellite, not Smithsonite. I have found various images of Smithsonite and Wavellite that look like the pendant. Gary knew the source location which can be definitive as I understand it, and I'm no geologist, so must defer to Gary in calling it Smithsonite while noting that knowledgable people disagree. As explained above, a chemical test would be destructive. The discussion brings up another point as well: even though I was trained as a biologist to identify life forms by their genus and species, I find that categorization of any other person or life form or rock should be secondary to meeting them as an individual first. We learn so much more when we allow another's own uniqueness to wash over us before the calculative mind confines them to some category. That's how I select the rock people I include in my jewelry, so please forgive me if I can't settle disagreements like this one! Please order this little pendant today, contemplate its fascinating composition and let it drain all that unnecessary stress away.